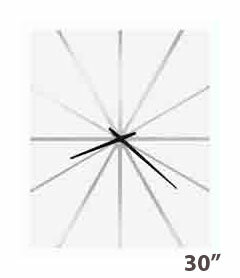 Contemporary Wall Clocks to accent any decor. Clean, simple lines create a new focal point for any area. These styles compliment a casual atmosphere with open spaces, neutral colors and elements and materials. Contemporary, Modern Wall Clocks at The Clock Depot by Howard Miller Clocks and Hermle Wall Clocks and other famous brands. 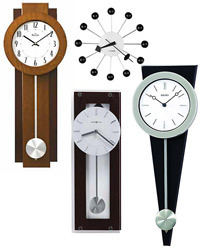 Free Shipping on all Howard Miller Wall Clocks! The Howard Miller Aaron is a smaller profile contemporary wall clock nicely contrasted by a burlwood printed back panel and features flat glass with polished mirrored edge that frames the dial and pendulum. In low light environments, this finish is very dark. White dial with black Arabic numerals, hour markers and hands surrounded by a polished nickel finished bezel. A contemporary nickel finished, cylindrical pendulum hangs below. Accurate Quartz, battery-operated single chime movement plays Westminster melody and strikes on the hour. Volume control and automatic nighttime melody shut-off option. One year warranty and Free Shipping. 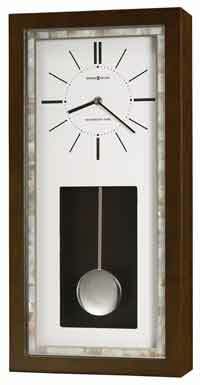 Size: Height 21" Width 7.75" Depth 4.5"
This special 82nd Anniversary Edition Contemporary wall clock is one our more popular pendulum chiming wall clocks and features a white dial with black Roman numerals and a brushed nickel bezel. A spun nickel pendulum bob is suspended in front of a mirrored back. Finished in Black Satin. One Year Warranty. Quartz, triple chime Harmonic movement plays your choice of Westminster, Ave Maria, or Bim-Bam chimes with volume control and automatic nighttime chime shut-off option. Size: Height 23-1/4" Width 10-3/4" Depth 4-1/4"
This brushed nickel-finished wall clock coordinates with todays latest interior styles. Behind the glass crystal, the white dial features black Arabic numerals, black spade hour and minute hands, and a black second hand. The locking rear cover twists off for easy mounting. Quartz, battery operated movement. Brushed nickel finish. Size: Dia. 8-1/2" D. 1-1/2"
This retro clock is an adaptation of a classic George Nelson design that was first produced by Howard Miller in the 1940s. The center is finished in brushed nickel, and is surrounded by 12 black satin balls on nickel finished rods. Black hands complete the duotone style. Quartz, battery operated movement. Size: D. 2" Dia. 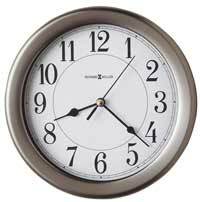 14"
This Extra Large wall clock is 42 inch in diameter. This oversized retro gallery wall clock is an adaptation of a classic 1940s George Nelson design. The center is finished in brushed nickel and is surrounded by 12 screw on black satin balls on screw on nickel finished rods. Black satin finished hour and minute hands. Quartz, battery operated movement. Finished in Brushed Nickel Finished with Satin Black Movement: Quartz, Battery-operated Movement uses one AA battery. One year warranty and free shipping. 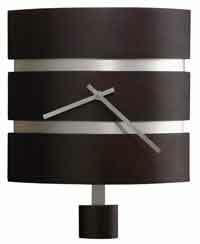 At home in the most up-to-date atmospheres, this wall clock combines a Merlot Cherry finish with brushed nickel accents. The brushed nickel-finished pendulum and bezel add to the contemporary styling. The crisp white dial features black bar hour markers and black hour and minute hands. Finished in Merlot Cherry, a very dark maroon finish that is leaning toward black on an injected molded body. Quartz, battery operated movement. Size: Height 35" Width 12" Depth 3"
The Howard Miller Braxton 625-628 Wall Clock is finished in Black Coffee on select hardwoods and veneers. The white dial features black Arabic numerals and minute track. The polished silver-tone bezel matches the brushed silver finished pendulum bob. The wooden pendulum stick matches the color of the case. The single chime quartz movement plays the Westminster chime on the hour and gives an hour count. One Year Warranty and Free Shipping. 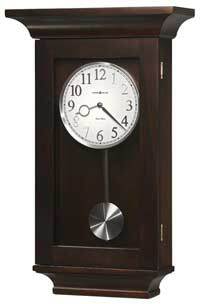 Size: Height 23.5", Width 13", Depth 5.25"
The Howard Miller Chaz 625-614 Contemporary Wall Clock is finished in a Satin Silver on select hardwoods and veneers. This clock features insert mirror panels accenting the fixed front frame. The white dial has polished chrome bar hour markers and hands. The rectangle cut-out reveals a polished chrome-finished pendulum bob. The Chaz features a accurate Quartz, battery-operated, single-chime movement that plays the Westminster chime on the hour and counts the hour. It also features Automatic nighttime chime shut-off. Requires four AA sized batteries (not included). One Year Warranty and Free Shipping. Size : Height 23", Width 10.75", Depth 3.75"
Howard Miller 625-690 Chronos Watch Dial III has a sophisticated wall clock dial that is inspired by the time-honored, sleek design of a formal wrist-watch. The 16" diameter circular spun silver-finished metal case frames the circular spun satin silver finished dial which has applied, satin silver-finished, tapered bar style hour markers and a bright silver-finished inner ring with black minute track. Quartz, battery-operated movement requires one AA sized battery (not included). One Year Warranty and Free Shipping. Size : Diameter 16", Depth 2.25"
This Contemporary Wall Clock offers a flat glass covering the entire front of this contemporary wall clock, which features a Wenge look black coffee finished back panel with brushed nickel finished accents. The white dial offers raised markers and straight hands, all with a brushed nickel finish. The cylindrical pendulum, finished in brushed nickel, complements the dial. Quartz, battery operated movement. One Year warranty and Free Shipping. Size: H. 23" W. 7-1/2" D. 2-3/4"
Howard Miller Daxton 625-670 Contemporary Wall Clock features an elongated diamond shaped case finished in Black Coffee on select hardwoods and veneers. A bold, circular brushed, silver-tone finished metal bezel surrounds the crisp white dial with applied polished chrome finished bar style hour markers and silver-tone hour and minute hands behind a convex glass crystal. Accurate Quartz, battery-operated movement requires one AA sized battery (not included). One Year Warranty and Free Shipping. Size: Height 21.5", Width 8.5", Depth 3.25"
Howard Miller Deco 625-695 Wall Clock is a contemporary wall clock finished in Black Coffee and features angled side panels secured by curved top and bottom panels that are highlighted by decorative satin silver-finished bands. The crisp, white dial includes a recessed center with square hour markers and simple black hour and minute hands. Accurate Quartz, battery-operated movement requires one AA sized battery (not included). One Year Warranty and Free Shipping. Size: Height 23.5", Width 8.25", Depth 3"
Spun nickel finished metal encircles the easy to read dial in this contemporary wall clock. White dial with bold black Arabic numerals and a separate seconds track. Black hour, minute and second hands beneath a glass crystal. Accurate Quartz, battery operated movement. One year warranty and Free Shipping. The Howard Miller 625-514 Emmett is a smaller, contemporary wall clock with a 3/16" thick plate glass cover suspended on polished chrome finished buttons in a Black Coffee finish. The white dial features chrome finished applied bar style hour markers and silver-finished hour and minute hands. Swinging pendulum. Spun satin silver finished pendulum. Quartz, non - chiming battery-operated movement. One year warranty and Free Shipping. Size: H. 19" W. 6-1/4" D. 3"
Natural Walnut finish on solid Walnut hardwood, featuring knots, natural edges, and distressing that brings out the rich character of the wood. 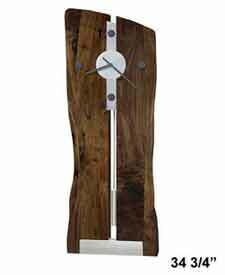 This contemporary live edge wall clock has metal accents finished in brushed nickel. Each clock is unique due to the natural characteristics of the solid hardwood. The dial features a raised center disc and vertical bar finished in brushed nickel with applied round hour markers finished in medium charcoal at the 3, 6, 9, and 12 positions. The hour and minute hands are also finished in medium charcoal. The stylish pendulum features a cylindrical bob with a round stick finished in brushed nickel. Quartz, battery-operated movements require two AA sized batteries. Designed and Assembled in the USA. Size: Height 34.75" Width 13" Depth 3.75"
This modern wall clock has quality features for todays homes. The off-white dial is surrounded by a brushed nickel bezel and offers embossed, brushed nickel Arabic numerals. The wooden stick swinging pendulum features a brushed nickel swinging pendulum bob. Black Coffee finish on select hardwoods and veneers. Quartz, dual chime quartz movement plays Westminster or Ave Maria chimes by a selector switch inside. Volume control and automatic nighttime chime shut-off feature. One Year Full Warranty. Size: H. 26" W. 15-1/2" D. 6"
Modern, two-tone pendulum cast resin Contemporary wall clock features brushed nickel and satin black finishes. The swinging pendulum has a spun silver finished bob suspended on a silver tone metal stick. The black dial features smartly contrasting silver Arabic numerals and hands. Quartz, battery operated movement. Size: H. 33" W. 12-1/2" D. 3"
This rectangular wall clock is finished in Espresso and features mother of pearl trim beneath flat glass and framed by two mirrored lines. White dial with black bar hour markers, black hands, and a cut-out that reveals a polished chrome-finished pendulum bob with silver-finished stick. Accurate Quartz, battery-operated, single-chime movement plays Westminster chime on the hour and counts the hour. Automatic nighttime chime shut-off. Requires four AA sized batteries. One year full warranty and Free Shipping. Size: Height 22" Width 10.75" Depth 3.75"
Contemporary wall clock with a white dial with brushed-nickel bezel, raised bar style hour markers, center ring, black hour and minute hands. This Clock is finished in Rustic Espresso on select hardwoods and veneers. Quartz, triple chime Harmonic movement plays your choice of Westminster, Ave Maria, or Bim-Bam chimes, with volume control and automatic nighttime chime shut-off option. A 24" square wrought iron wall clock with applied Roman numerals, markers and center panel with a natural machined steel finish with grind marks and distressing for and industrial look. Straight, tapered hands are in a charcoal finish. Quartz, battery-operated movement requires 1 AA sized battery (not included). One year warranty and Free Shipping. Size: Width 24" Height 24" Depth 2.75"
Size: Height 23.5", Width 8.25", Depth 2.75"
The 625-404 Morrison is part of the modern Studio 24 Collection by Howard Miller. This contemporary rectangular wood wall clock features a curved front with recessed brushed nickel bands, with complementing brushed nickel finished hands. The curved pendulum bob, also finished in Black Coffee, is supported by a bold brushed nickel stick to match the case. Black Coffee finish on select hardwoods and veneers. Accurate quartz movement uses "AA" batteries. One Year Warranty. Size: H. 14" W. 11-1/4" D. 2-3/4"
This large wall clock features a High-gloss Black finished ring with a polished chrome-finished plated center disk and cross bars. The hour and minute hands and bold hour markers are also chrome-finished. Quartz, battery-operated movement requires one AA sized battery. One year warranty and Free Shipping. 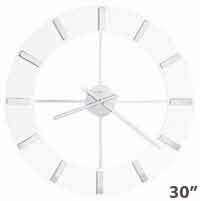 Overall Dimensions: Diameter 30" Depth 2"
This large wall clock features a High-gloss White finished ring with a polished chrome-finished plated center disk and cross bars. The hour and minute hands and bold hour markers are also chrome-finished. Quartz, battery-operated movement requires one AA sized battery. One year warranty and Free Shipping. The Howard Miller Penrod 625-581 Large Wall Clock is an impressive oversize wall clock measuring at a full 34 1/2 Inches in height. This rectangular wall clock is finished in a weathered, Driftwood finish inspired by the natural yet rustic nature of reclaimed woods. The black dial features polished chrome Roman numerals and hands. Quartz battery-operated movement requires one AA battery. One year warranty and Free Shipping. Size: Height 34.5", Width 26.5", Depth 2.75"
This smaller, brushed nickel-finished wall clock makes a great accent for the latest casual interior styles. Behind a glass crystal is a spun silver-tone dial with black Arabic numerals and spade hands. The locking rear cover twists off for easy wall mounting. Quartz, battery operated movement. Requires 1 AA battery (not included). Brushed nickel finish. One year warranty and Free Shipping. Size: Size: Dia. 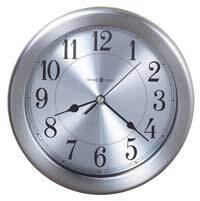 8-1/2" , D. 1-1/2"
The Howard Miller Prichard 625-496 15" diameter large wall clock features a satin nickel finished metal wall clock on an Espresso finished back panel. The dial features stamped Roman numerals and satin nickel finished hour and minute hands with open fret cut diamond tips. Quartz, battery operated movement. One year warranty and Free Shipping. Size: Dia. 15" D. 1-3/4"
Black Coffee finish on select hardwoods and oak veneers and features a flat glass accented by a black border with white dot pattern and polished black and chrome-finished square embellishments on the corners. White dial with applied polished chrome-finished Arabic numerals and bar hour markers, black hour and minute hands, and a silver-finished seconds hand. A polished chrome-finished dual-cylinder pendulum bob with metal stick hangs below the dial. Quartz, battery-operated, single-chime movement plays Westminster chime melody on the hour and counts the hour without quarter hour chime. Automatic nighttime chime shut-off. Requires four AA sized batteries. One year warranty and Free Shipping. Size: Height 21" Width 10" Depth 3.5"
The Howard Miller Spokane is a large, 15-3/4" modern brushed aluminum wall clock featuring a flat glass crystal over a white dial. Black Arabic numerals and black hour, minute, and second hands with a minute track around the dial. Quartz, battery operated movement. One year warranty and Free Shipping. 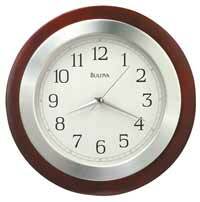 This economical clock features an oil-rubbed bronze finish. A convenient wall mount system includes a twist-off back cover. This cover may be mounted to a wall with a 3-point secure screw mount system, which makes this an ideal choice for boats and recreational vehicles. Black Arabic numerals and spade hands are easy to read against cream colored dial. Water resistant. Quartz, battery operated movement. One year warranty. 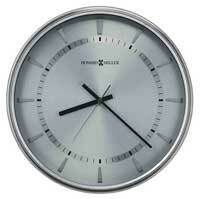 The Howard Miller Zander 625-616 Large Wall Clock is a 30 x 25 inch rectangle clock with contemporary design. The high gloss white finished backing is segmented by inset chrome finished hour markers, giving the clock a starburst pattern. The black tapered hands in a high gloss finish set this clock apart and make it easy to read from a distance. Highly accurate quartz movement requires one AA battery (Not Included). One year warranty and Free Shipping. 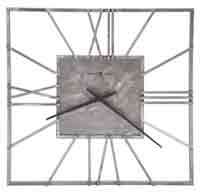 The Howard Miller Zander II 625-617 Large Wall Clock is a oversized contemporary designed rectangle clock. 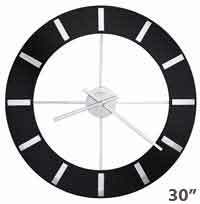 The chrome finished hour markers segment the high gloss black finished backing in a starburst pattern. The red tapered hands in a high gloss finish set this clock apart and make it easy to read from a distance. Highly accurate quartz movement requires one AA battery (Not Included). Size : H 30", W 25", D 2.5"
Clean, contemporary dimensional wall clock with a dark walnut backing and a lighter front panel and dial. 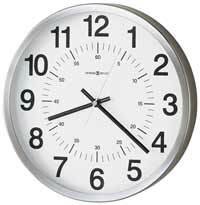 Easy to read white dial with standard Arabic numerals make this clock very easy to read from a distance. Convex glass crystal over dial keeps light from reflecting across the entire dial. Brushed aluminum swinging pendulum. Accurate Quartz, battery operated movement. One year warranty and Free Shipping. Size: H: 23.5", W: 8.75", D: 3"
Solid Wood Case with a walnut finish. Accurate non-ticking, Quiet Sweep quartz movement uses one AA battery. Brushed Aluminum wide bezel surrounds the dial. Size: H: 14" W: 14" D: 1.50"
The Bulova C4256 Espresso Wall Clock features a solid hardwood case with a dark contemporary Espresso finish. The solid wood frame has decorative vertical cuts to create a segmented look. A soft white dial is printed with traditional black numerals and spaded hands and a silver-tone second hand for easy viewing. A protective glass crystal covers the dial. Accurate, Quiet Sweep movement eliminates any ticking. One year warranty and Free Shipping. 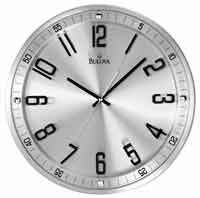 Bulova C4646 Silhouette Contemporary Wall Clock in a Stainless Steel Finish with glass crystal that extends above the dial. Chrome dial retainers hold the dial above the face. 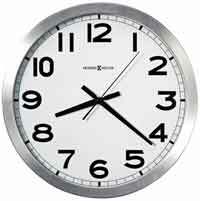 The numerals are printed onto the dial which is raised above the brushed, circular stainless steel to add depth and interest to this modern wall clock. Black hour and minute hands add great contrast to the stainless steel while adding a silver second hand. One year warranty and Free Shipping. The Copper Classic is a metal wall clock with a copper case and a black molded dial. It has raised hour and minute markers filled with a copper resin and includes a protective glass crystal. Requires (1) AA battery. One Year Warranty and Free Shipping. Size: Dia. 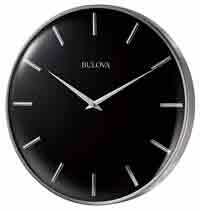 : 12.5" D: 2"
The Bulova C4834 Luxfer Prism wall clock has a metal case in a bronze finish. 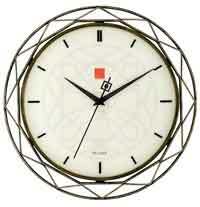 The cream dial features a light grey geometric design and the red square Frank Lloyd Wright trademark. The black raised hour markers on the face are protected by a convex glass lens. 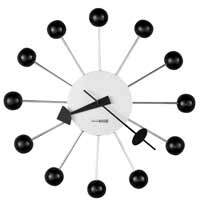 The accurate quiet sweep movement makes this a great clock for any room. One Year Warranty and Free Shipping. Size : Dia. : 14" D: 1.75"